Sun strikes Earth Some is reflected back to space or converted to heat. 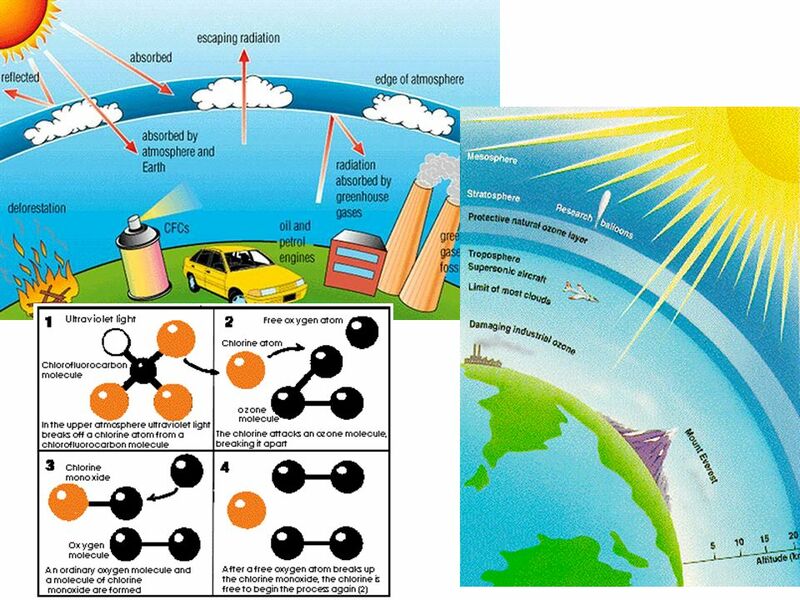 Some heat radiates back to space or trapped in biosphere Balance determines Earth’s average temperature Gases that control in atmosphere are carbon dioxide, methane, water vapor. 5 These gases are greenhouse gases. 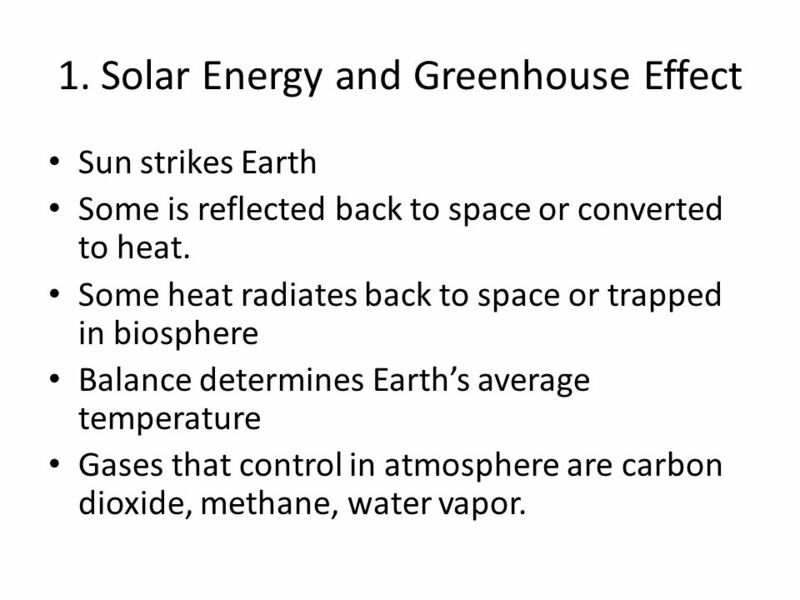 Greenhouse effect – allows visible light to enter but traps heat. 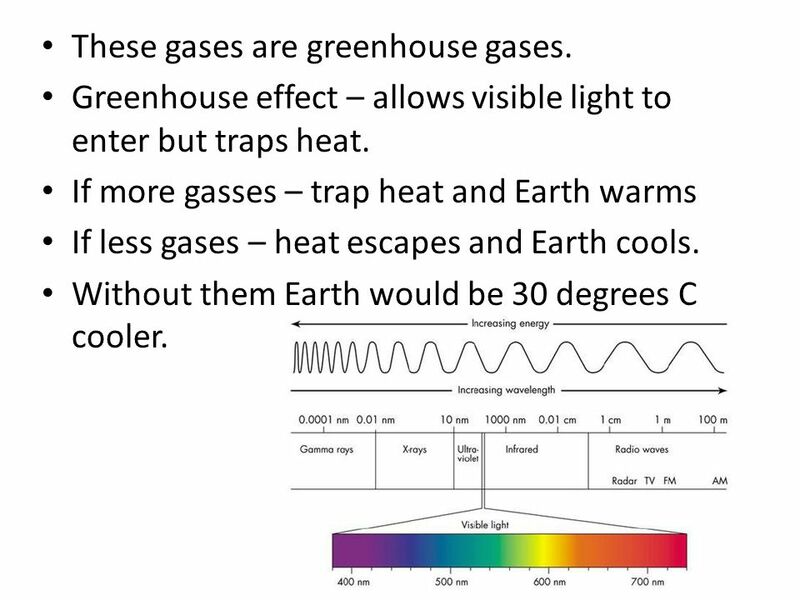 If more gasses – trap heat and Earth warms If less gases – heat escapes and Earth cools. Without them Earth would be 30 degrees C cooler. Unequal distribution of heat across globe creates wind and ocean currents. These transport heat and moisture. 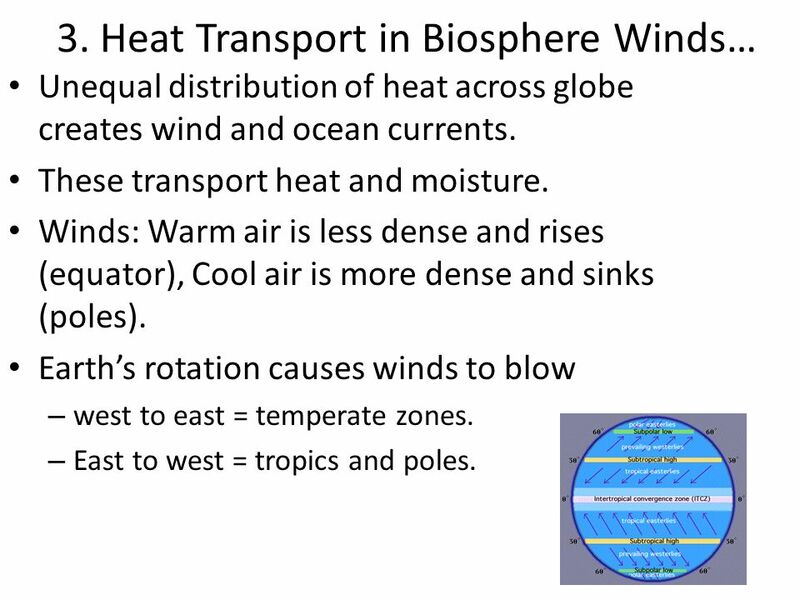 Winds: Warm air is less dense and rises (equator), Cool air is more dense and sinks (poles). Earth’s rotation causes winds to blow west to east = temperate zones. 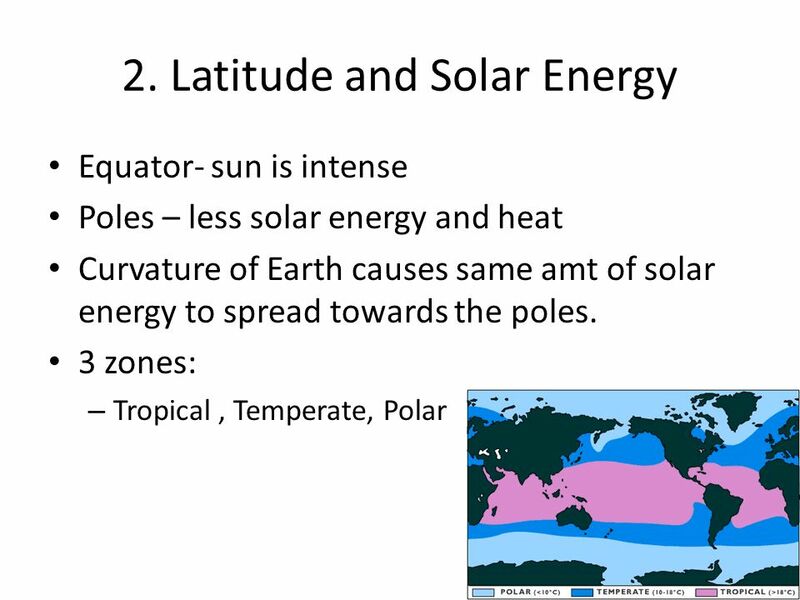 East to west = tropics and poles. 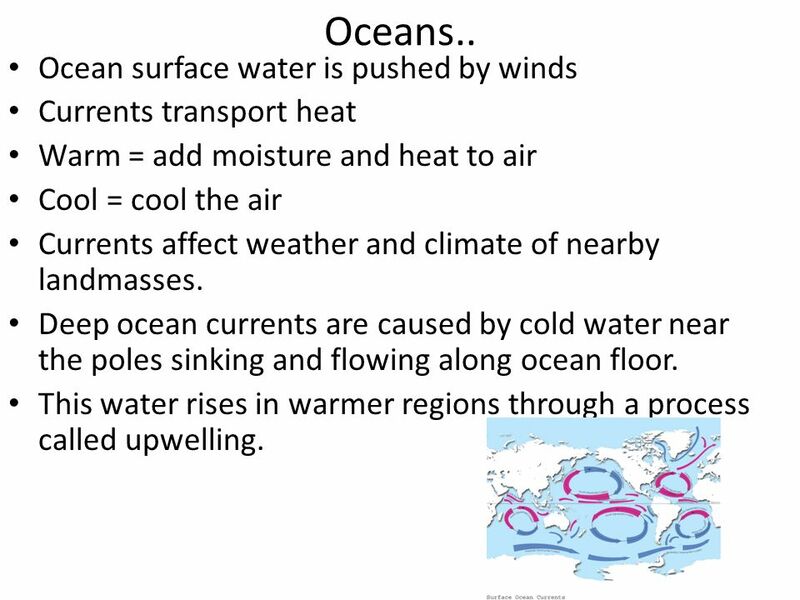 Currents transport heat Warm = add moisture and heat to air Cool = cool the air Currents affect weather and climate of nearby landmasses. Deep ocean currents are caused by cold water near the poles sinking and flowing along ocean floor. This water rises in warmer regions through a process called upwelling. 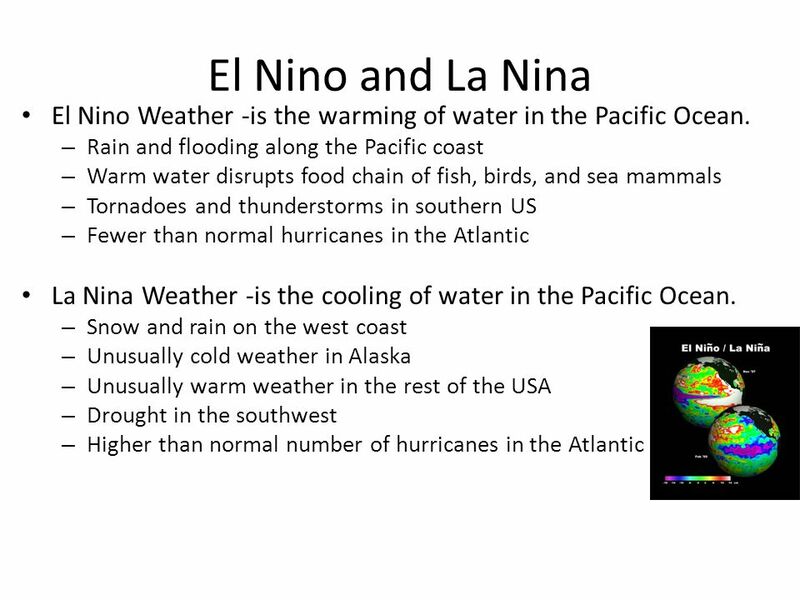 11 El Nino and La Nina are the most powerful phenomenon on the earth and alter the climate across more than half the planet. 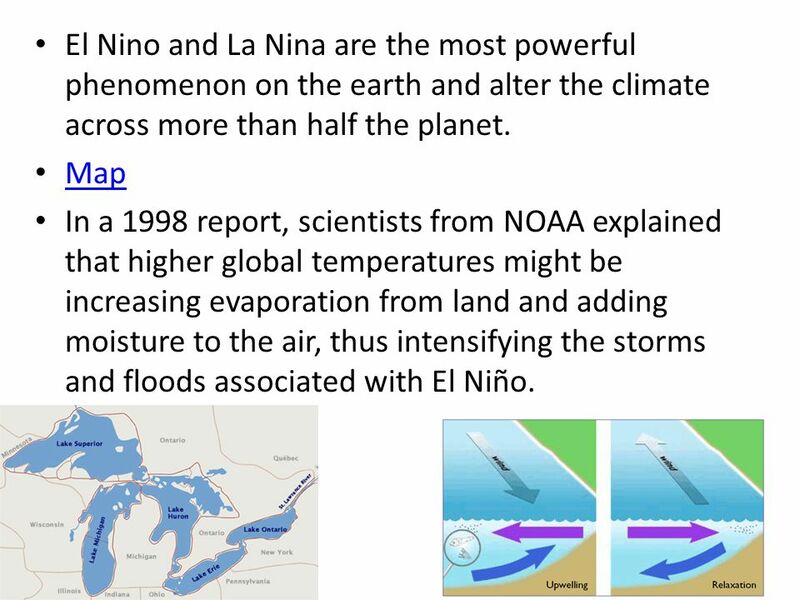 Map In a 1998 report, scientists from NOAA explained that higher global temperatures might be increasing evaporation from land and adding moisture to the air, thus intensifying the storms and floods associated with El Niño. The Great Lakes have a big influence on the climate. Acting as a giant heat sink, the lakes moderate the temperatures of the surrounding land, cooling the summers and warming the winters. This results in a milder climate in portions of the basin compared to other locations of similar latitude. The lakes also act as a giant humidifier, increasing the moisture content of the air throughout the year. In the winter, this moisture condenses as snow when it reaches the land, creating heavy snowfall in some areas, known as "snow belts" on the downwind shores of the lakes. The shores of Lake Superior are prone to this "lake effect" snow and have recorded up to 350 inches of snow in a single year. During the winter, the temperature of the lakes continues to drop. 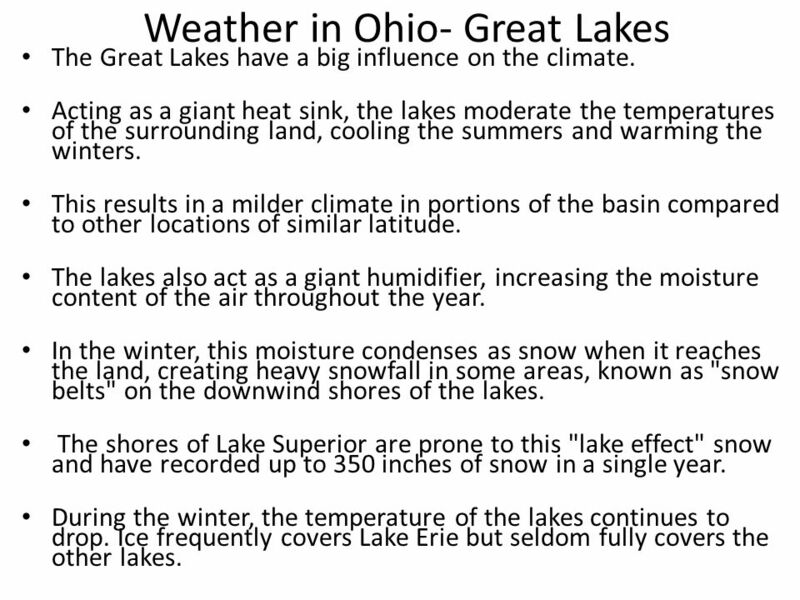 Ice frequently covers Lake Erie but seldom fully covers the other lakes. 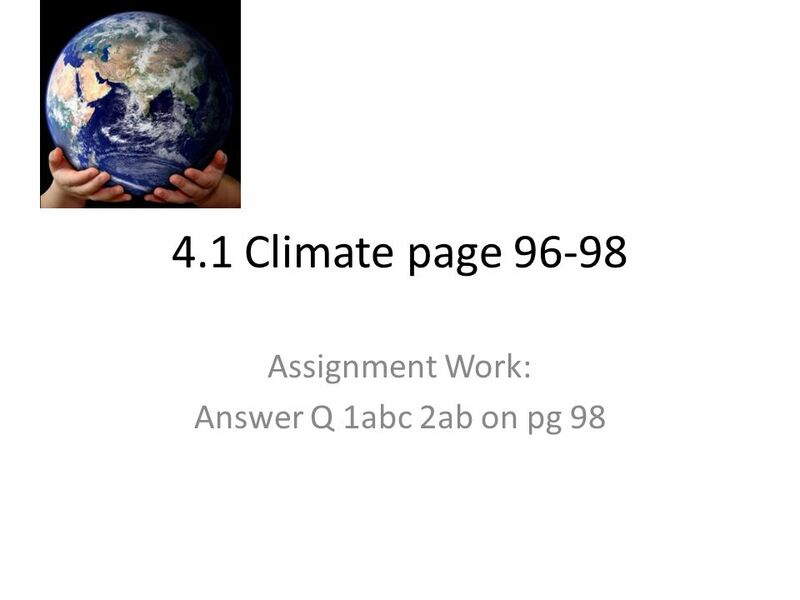 Download ppt "Assignment Work: Answer Q 1abc 2ab on pg 98"
This postcard shows a warm coastal climate. How does atmospheric pressure distribute energy? 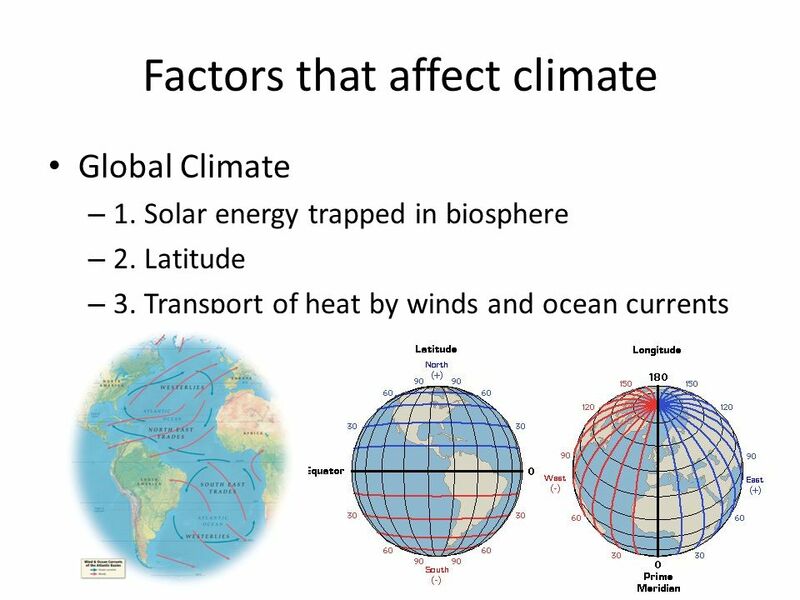 Climate Lesson What factors contribute to a region’s climate? 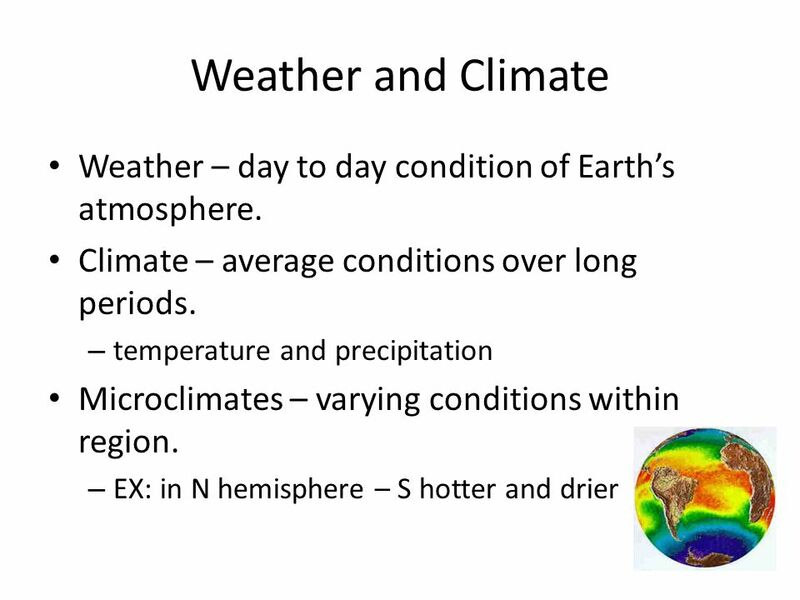 6.4.8: Explain how convection affects weather patterns and climate. S6E2.c. relate the tilt of earth to the distribution of sunlight through the year and its effect on climate. Currents are produced by forces acting upon the water. Surface ocean currents are formed by winds that cause the water to move in the direction that the.